We've had this book from our local library this week. I borrowed it once before but wasn't inspired to try any recipes; however this time, the boys have been making meal plans and using the book as a reference. I'm glad that they were willing to try some new recipes, though some of the meals we've made this week haven't been universally approved of! However, tonight was a success! I made the Tip-Top Tofu Loaf, the Cumin-Fried Potatoes and the Coconut Chocolate Chip Cookies. Wow, dinner disappeared like a trailer in a tornado. 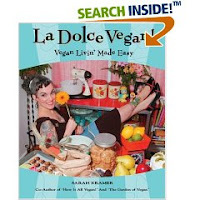 I own the first two books in this series - How it all Vegan and The Garden of Vegan, co-written by Tanya Barnard and Sarah Kramer. Sarah is going it alone in the third book, but it is full of all the good advice and fun stuff that I enjoyed in the other books.